The coal terminal at the port of Caofeidian is a major hub for supplying the power plants in the south of China. Coal from the mines in the north of the country is brought by train to the port for onward shipping. 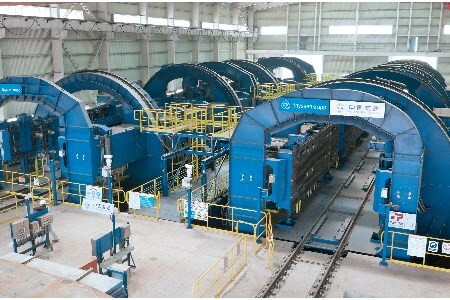 Over the past few years, thyssenkrupp has supplied Caofeidian with eight shiploaders and two quadruple rail car dumper stations for speedy unloading. Each of these two new dumper stations can unload four 80 t capacity coal cars at a time. The four cars are positioned in the dumper so that they rotate around their coupling axis and at the same time discharge their loads into the silo below. The positioning of the full train and emptying of the next four cars is controlled by a positioner (indexer) to ensure fast and reliable unloading. The positioner travels parallel to the track and indexes the entire train. The car couplers themselves are rotary couplers, so it is not necessary to uncouple the cars from the train. The positioner pushes the entire train with a total of 204 cars and four locomotives; the locomotives are not required to move or slow down the train at any point in the unloading process. As soon as all the cars have passed through the dumper and discharged their contents, the locomotives take over again to move the emptied train out of the port. In this way a quadruple dumper is capable of handling 8640 tph of coal, which means an entire train can be unloaded in just two hours. Each of the dumper stations is fitted with a dust collector, fresh air ventilation, and a water sprayer for dust control. Vibrators on the dumper barrel ensure all coal residues are removed from the cars. Camera systems have been installed to allow monitoring of the entire unloading process.